Woodrow Wilson was 28th President of the US serving from 1913 to 1921. He is best remembered for his role in the First World War – keeping the US out of the war, until reluctantly entering in 1917. 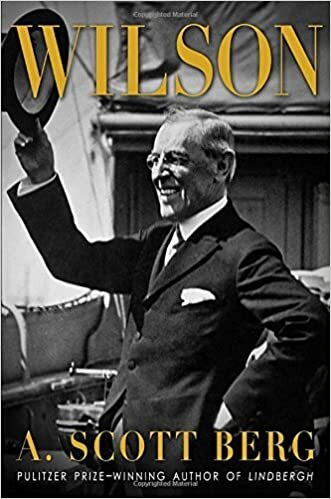 At the end of the war, Woodrow Wilson formulated his 14 points, which sought to create an international League of Nations and institute principles of self-determination and justice as the basis for the armistice. He was awarded the Nobel Peace Prize in 1919. Woodrow Wilson was also a progressive with attempts to control big business and end elitism in universities. He was born on 28 December 1856 in Staunton, Virginia. His father identified with the Confederacy and defended slavery. However, Woodrow Wilson did not share his father’s views on this, later writing. “Because I love the South, I rejoice in the failure of the Confederacy.” (March 1880). In 1885, he married Ellen Louise Axon and together they had three daughters. Wilson studied at John Hopkins University and gained a PhD in history and political science. He went on to have a distinguished academic career becoming the principal of Princeton. Graduated income tax – to try and redistribute income and opportunity. Antitrust legislation against big business and vested monopoly powers. Greater protection for labour, e.g. new restrictions on child labour. Federal Reserve Act – which allowed the Federal Reserve the ability to increase the money supply. Wilson argued no country can afford to have its prosperity originated by a small controlling class. In 1916, he narrowly won re-election campaigning on an anti-war stance. However, after 1916, public opinion hardened against Germany. Germany’s unrestricted submarine warfare, such as the sinking of the Lusitania, led to serious American casualties. Then in January 1917, the publication of the Zimmerman Telegram suggested Germany was willing to help Mexico regain territory in Southern US. By April 1917, Wilson had overcome his deep reluctance to go to war and asked Congress to declare war on the government of Germany. Congress overwhelmingly supported the decision. In 1917, the US army was very small, and to the Allies a disappointment; it took time for the US army to make a difference on the western front. However, by 1918, the steady increase in the number of American troops was beginning to make a difference and American forces helped to swing the balance against Germany. By November 1918, the Germans surrendered. 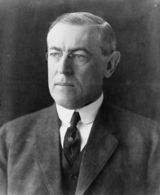 At the end of the war, Woodrow Wilson presented his fourteen points to the Allies as a basis for a just armistice. The fourteen points included the general principle of self-determination. International arbitration for colonial disputes – through the creation of a League of Nations. Recognizing the principle of self-determination. However, the victorious Allies, who had suffered much greater financial and human loss were in less mood to be magnanimous. France, and to a lesser extent Great Britain, wanted to impose reparations and a harsh peace treaty on Germany. There was also a reluctance to accept the principle of self-determination because of their Empires and colonies. The British PM said of Woodrow Wilson and his French counterpart at the Treaty of Versailles. Back in the US, a Republican controlled Congress also rejected Wilsons’ 14 points. Republicans wanted the US to remain isolated from the problems of Europe and didn’t want to be part of the League of Nations. Wilson began a campaign to support his peace plan, but he collapsed after a bout of influenza and spent the next three years of his life as an invalid until his death in 1924. Woodrow Wilson was a founder member of the Presbyterian church in the US and was deeply religious. He cycled regularly and was a very keen golfer. Citation: Pettinger, Tejvan. “Biography of Woodrow Wilson”, Oxford, www.biographyonline.net, Published 10 Sep 2012. Updated 8 February 2018. I love learning about Woodrow Wilson!